Abloy is a leading manufacturer of high security industrial locks. Including padlocks, cam locks, vending locks, and cabinet locks. Considered to be the ultimate locking system, Abloy Protec offers a full range of high security door cylinders and uses a “one key, many locks” system making it very easy to cut one key to fit and open many types of Abloy locks. With a unique, rotating disk cylinder, keys and cuts are made in two different radii making Abloy key duplication impossible. In addition, the locking system is designed to stop any attempt to manipulate disks making Abloy Protec the most secure mechanism in the mechanical keying market. Abloy locks are scientifically-designed to withstand the most extreme weather conditions such as salt air, rain, snow and freezing temperatures. Abloy Protec keys have a long and trouble-free service life. Each Abloy key is made using a dedicated key-cutting machine ensuring that key duplication is strictly controlled. 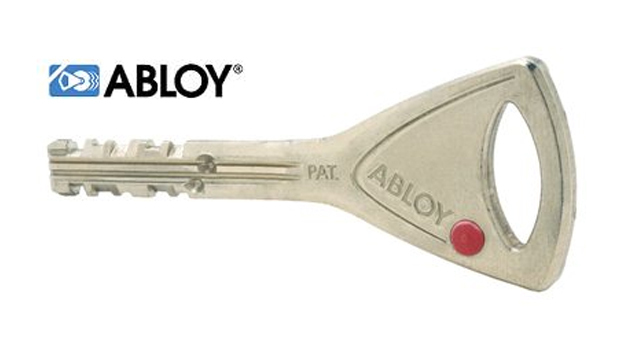 The Abloy Protec cylinder mechanism, keys and key blanks are protected by patents worldwide through 2019. Also, security is optimised by the vast number of key combinations. With 1.97 billion different combinations per keyway, the rotating disc cylinder offers extensive master-keying possibilities and enables locking systems to include thousands of doors and employees. Abloy Protec can be integrated with existing or new electromechanical CLIQ technology. This system is easy-to-use and is flexible enough to be customized. The CLIQ software allows system managers to create entry points per user and time restrictions. A complete user, lock and key audit are also available for review. A lost or stolen Protec key can be easily removed from the system. Complete lock system shutdown is available in case of an emergency and keys can be upgraded or deleted in case of personnel changes. Abloy started In 1907, when Emil Henriksson, an office machinery mechanic, invented the detainer disc locking cylinder. A locking solution with unique features, this invention continues to be the foundation for all Abloy keying systems, which are designed and manufactured in Finland. Contact the professionals at Wynns Locksmiths for more information on Abloy Protec.